Men often say that buying gifts for women are not an easy task, funny enough I have heard women say the exact same thing about men. But buying gifts for the woman in your life, your mom, girlfriend or sister does not have to be such a pain. The occasion is not so important; what it matters is that you take the time to look, and find something truly unique that will touch her heart. Gift giving has been around for thousand of years and was a way to express one’s feelings, to show how thankful they are or simply to tell the other person that they have been thinking about them. In our days, we tend to give gifts on special occasions only like Christmas, Birthdays, Mother’s day. In fact, they are passionate people out there who would like to surprise the special woman in their life without any particular event. So how can you be successful in finding the perfect gift? The first question is who you will be buying a gift for? You Mom, wife, sister or a co-worker. Getting a nice lingerie to a colleague might not be a great idea. Next step is to determine your budget. Not all unique gifts are expensive. Your good intentions are what counts and many women would appreciate your thought over the cost. Find out what her interests are. I have a friend who is captivated by Egyptian culture. Well, they are hundreds of astonishing, unique gifts related to the Egyptian culture. Remember that weight-loss products or bathroom scales are NO NO unless she specifically asks for it. Women talk a lot and share her likes and dislikes without a problem. The clues behind that conversations will only help you in your decision. So listen up! Now let’s take a look what we have picked for you. Your imagination, inspiration, and feeling will guide you to the right gift. Light up any kitchen with this brightly colored handle kitchen set. The Jaguar Kitchen Products Excellence Series set has an ergonomic design; it is made to last. The knife blades are from high-carbon steel, and the utensils were made from durable nylon, heat-resistant up to 390 F/200 C. 100 % FDA Grade, BPA free and dishwasher safe. 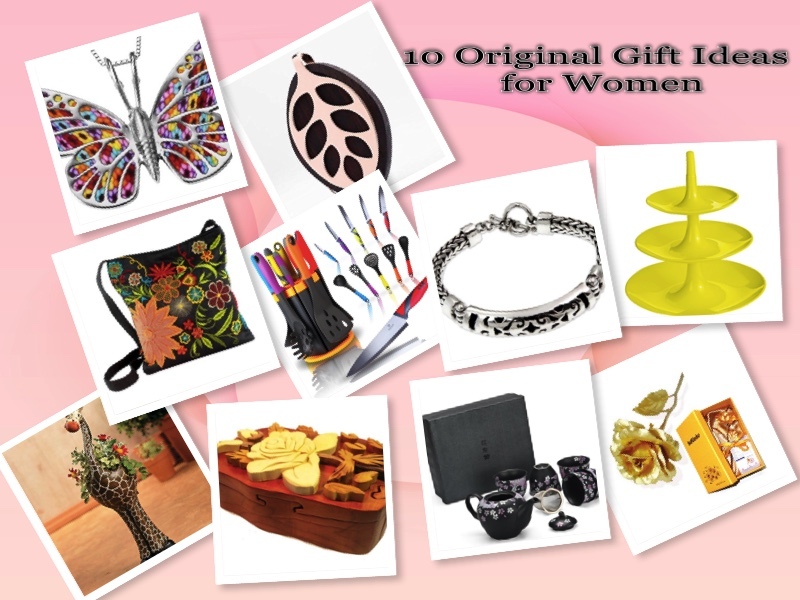 It is surely and an original gift idea that every woman will appreciate. This charming giraffe flowerpot made of resin. It can be used indoor or outdoor. An original gift for any occasion for someone who loves cuteness. A wonderful gift idea. 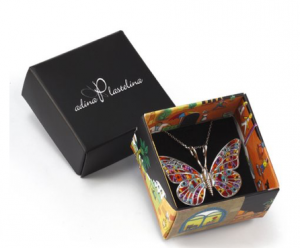 The beautiful butterfly necklace is handmade from an incredible millefiori polymer clay and set into a 925 sterling silver frame. Millefiori is Italian word for ”1000 Flowers” and it is the extraordinary technique used by Adina Plastelina to handcraft the millefiori jewelry collection. Polymer clay is manually shaped into various designs and coated with rhodium and transparent enamel to achieve the glowing and lasting results. It comes in 5 different colors to choose from and a lovely colorful jewelry gift box. An original Novica product in association with National Geographic. Certified and it is coming with official NOVICA Story Card certifying quality and authenticity. NOVICA works with talented designers around the world. To learn more about the artist of this beautiful bag and how to purchase it, please click on the image. Roses have always been a symbol of love, beauty, and appreciation. Giving a rose that lasts forever is unique and adorable gift idea. The Rose is 24K and comes with the certificate of authenticity. Made by the highly purified 24K Gold Leaf in Taiwan. An original Novica fair trade product includes an official NOVICA Story Card certifying quality and authenticity. The name of the artist is Wayan Asmana, and it is from Indonesia. Includes an original NOVICA Jewelry pouch as a gift. This beautiful bracelet is a magnificent example of modern Balinese design. of themes. 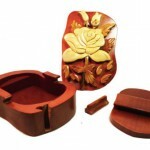 It can be used for decorative purposes, jewelry box, gift idea to give a small item and place it inside the box. My good friend Jen gave me one of those many years ago. She told me that she has been looking for something ”different and unique” as that what I am for her. Can’t hide that I felt special that someone took the time to look for a one-of-a-kind gift for me! Elegant and Beauty. Treat your guests with style. Sure this is an exceptional gift for those who praise uniqueness. The Moscow Mule Copper Mugs were handcrafted from stainless steel with a copper plated exterior and a brass handle. Stainless steel it is much easier to maintain than 100% copper mug in regards to cleaning and lasting for long. Here is a quick Russian recipe for classic vodka cocktail that can be served in those mugs in an authentic way. 2oz of vodka + 1/2 oz of lime juice and top it off with ginger. Add lots of ice and enjoy! I have one of those and absolutely love it! I actually use it as a fruit stand. The stand stacks in reverse. for storage. It is designed and made in Germany from solid color recyclable plastic. More colors are available. Every time someone visits my house I receive compliments. You can use this stand not only for a cake or fruits. Beautifully arranged appetizers would be a perfect use of it as well. You can remove each one of the three pieces of this stand and place them on the table. Well, this is on the wish list for three of my girlfriends. Why? This nice looking activity tracker monitors your activity and a sleep quality, assist with managing stress through guided breathing exercise. Tracks monthly cycles, so you are fully aware of your reproductive health. Wakes you up gently in the morning or can be set for different activity alerts. The Leaf is made using the highest quality hypoallergenic stainless steel; wich is both skin-friendly and durable. You decide the way you wear it – necklace, bracelet with LEAF accessories or items you already have. Requires not charges, it is powered by replaceable coin cell battery that lasts approximately six months. I hope our selection did help you find what you were looking for. I do not like going through long lists as I get more confused and end up not deciding what I want. I would love to hear comments from you! You’ve come up with some really great ideas that any woman would appreciate! Well done! Thank you, Christina! I hope so too! That is why I am trying to make it easy. I am looking for great gift ideas, write about why they are original, not overwhelming you with tons of suggestions, so you don’t get lost and actually make a decision without spending hours in endless search for uniqueness. Hey good job. I really need something like this because I am always in trouble when it comes to buying presents for my wife. I can never seem to be able to get the right one. But with your help I am sure I will make a good impression this year. Thank you, Constantin. That is what I love to hear that I can help someone with getting the perfect gift for their loved ones. I like giving original gifts, and I used to travel a lot and always picked the unique and original gifts for my family. I loved to see their happy faces every time they opened the gifts:) It is a wonderful feeling. Please feel free to contact me if you struggle with gift ideas and I would be happy to assist! Wow, these are some really awesome ideas for gifts. My girlfriends birthday is coming up in a couple of weeks and I am so glad I stumbled across this article. Just the other day were cooking together and I was kind of making fun of her cooking utensils. She loves to cook, but they seriously look like something from the 16th century. I will be bookmarking this page so that I can find these again! Thanks so much! Thank you, Garen! I am glad you found something that might turn to be a great gift! Wish I would have read your note about buying exercise equipment or bathroom scales for my wife a few years ago! She had said something to my daughter about it, so I thought she was wanting it for herself! (She didn’t need to lose weight! but she must want them for some reason!) Wrong! She was talking about a co-worker asking her for advice! The couch was very uncomfortable!! I won’t ever make that mistake again! Anyway, I love your Website! What an awesome idea!! I’m sure you know most men can’t make a decision when buying a gift for his girlfriend or if Married his wife! I will be back for sure, her birthday is in September! Thank you, Don! I am thrilled you like my website. My goal is to always write about unique, original and wonderful gift ideas and help people choose a perfect gift with spending less time searching for it. Please feel free to contact me if you need assistance in finding a special gift for a special person in your life and I would be happy to help!